I just finished a commission for Linda. 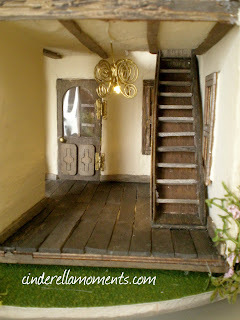 It's a half scale custom dollhouse English style. It has an oval base. 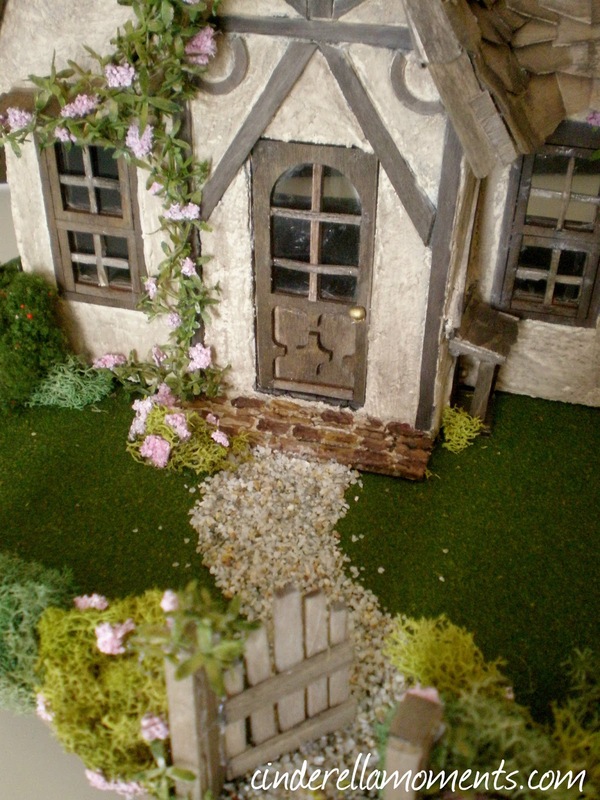 And I left room for Linda to put her potting shed and garden set. 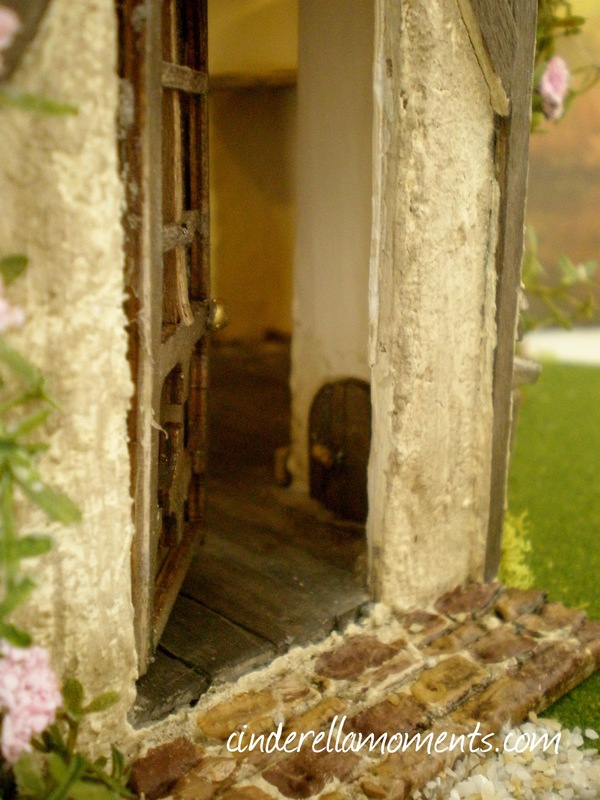 The little fairy door inside the dollhouse. The stone chimney has flowering vines. 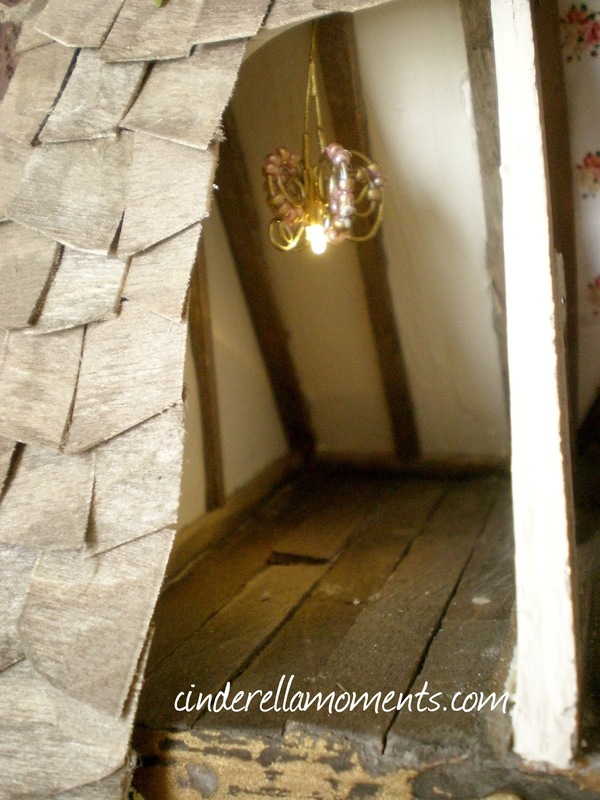 The interior is well aged and cozy. This is the kitchen. The old fireplace is the space for Linda's Aga stove. Thanks Linda for the project! Linda will send pictures once she's all done decorating Miss Read's Cottage. And I'll share them with all of you. She's already made some purchases that are out of this world cute! And again....a materpiece...my goodness...you are a eal artist. 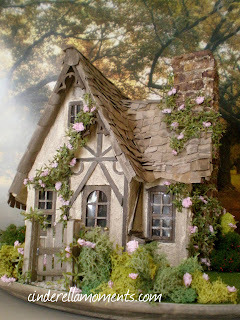 Again a delight to look at the beatiful pictues of a lovely house!!! Oh Wow! It is totally amazing! You couldn't have done better! You got the English feel and look perfect! 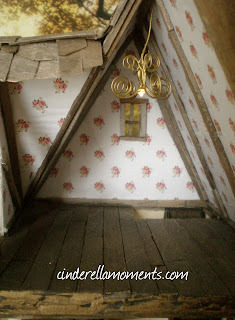 I have been in places that look just like it...bumpy floors and tilted roofs too! Every little detail is perfect! Linda must be over the moon! 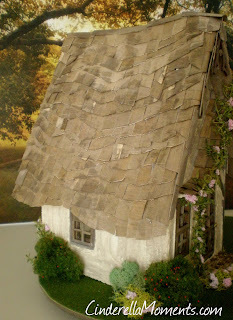 Very sweet work - especially love the roof. I have only recently discovered your work, I hope I can perfect mine to the same standard. Not too shabby. just the right amount of lived in. 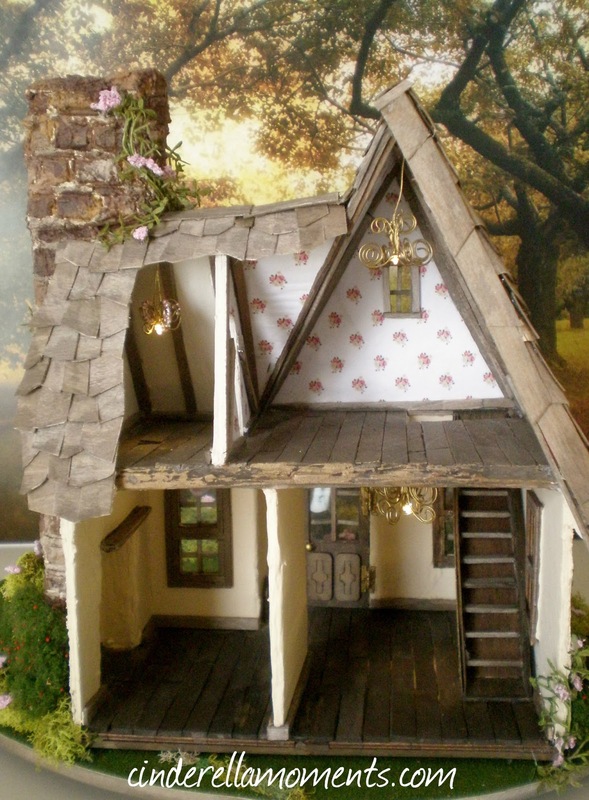 The appearance of this little English cottage is so captivating. 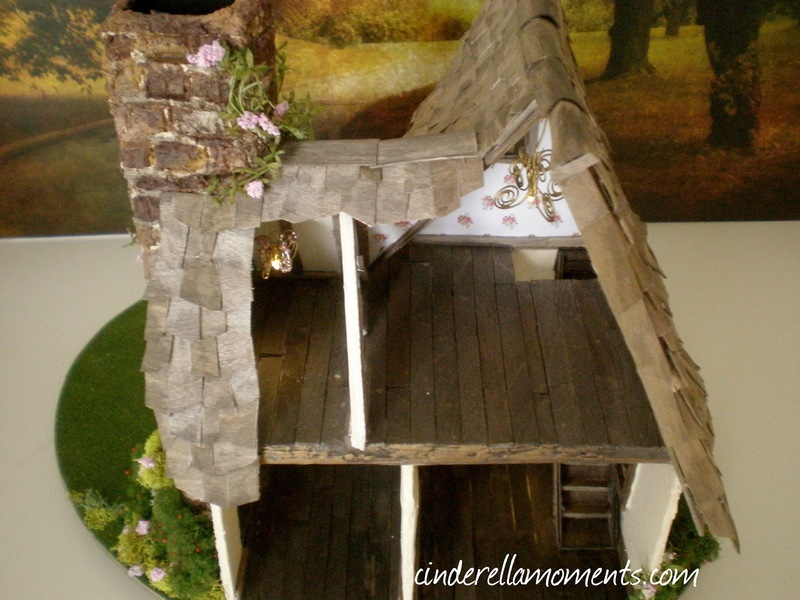 I love that roof! And, the interior is so welcoming! I love how you have finished it inside with the dark wood floors, the beams and the stairs are perfect for this sort of look. I would love to see it all dressed up inside. But, unfortunately, I can't place Linda at the moment. I'm sure I must know her but I just can't recall. You have gone and done it again. This is such a beautiful cottage. Love the outside touches. Looking forward to seeing the pictures when she has it all decorated!! I am speechless! This is a dream cottage, right out of Lake District. I think this one has now become my favourite! It is so cute! You have really hit the very cozy English Cottage environment. I think immediately of a film of Agatha Christie. 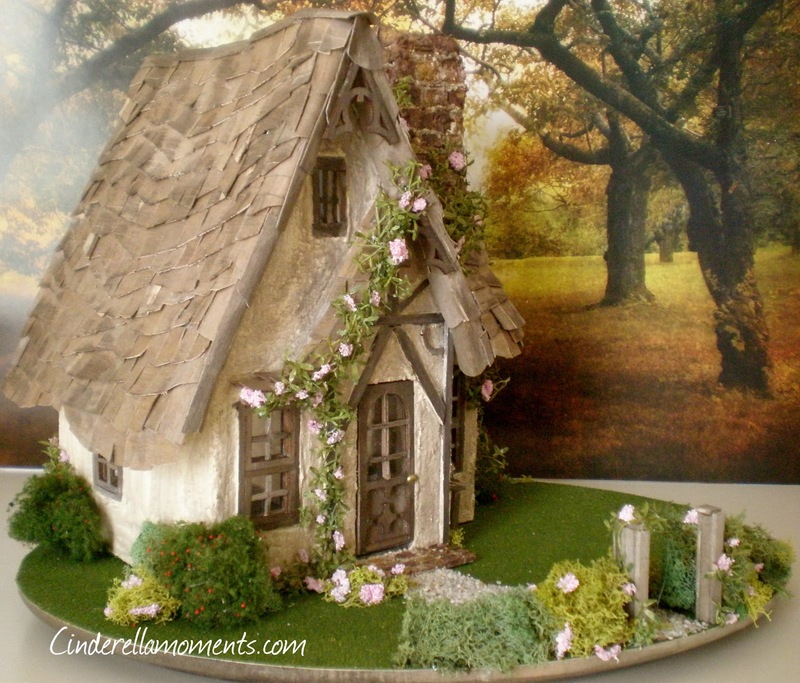 I can see, hear and smell a life around your adorable Cottage. Very beautifully made. wat een beeldig huisje is het weer geworden. en wat een werk maar het lijkt mij wel heel leuk om te doen. Fantastic job, as usual! I would really love to see a 'darker' piece from you! Maybe a halloween project? *-* Just a suggestion haha! I can say too much to say that this is one of your most successful projects? Caroline this is so beautiful!! 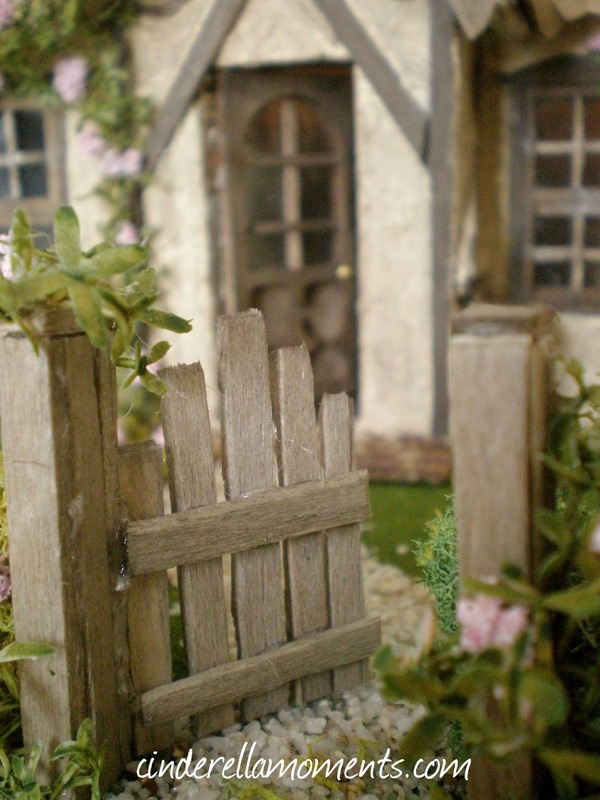 I adore the little gate and the winding path up to the cottage, it's a dream magical home. As usual, I am thoroughly enjoying your creations. I always picture myself in your houses, Caroline and I can totally feel the bliss :). 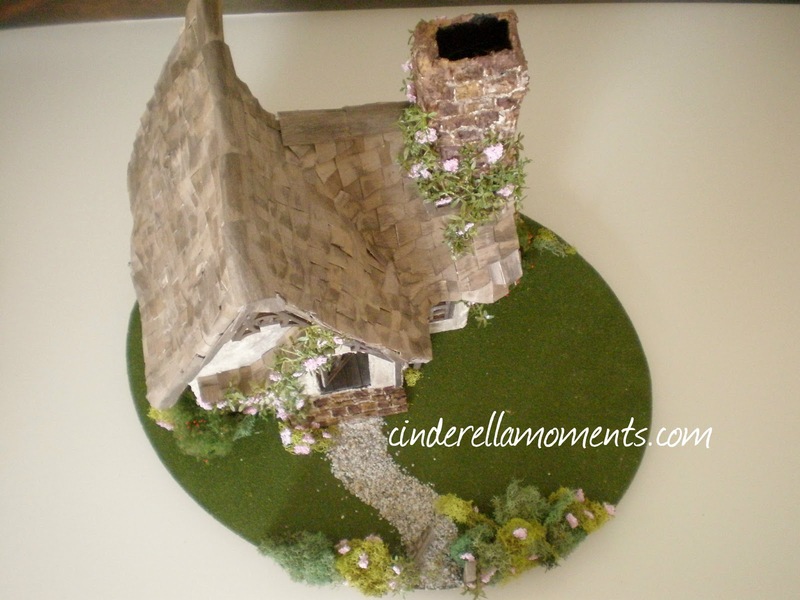 By the way, I was just thinking of using a round revolving base for my current project as well :):). I am always so amazed when I visit your blog- another beauty! 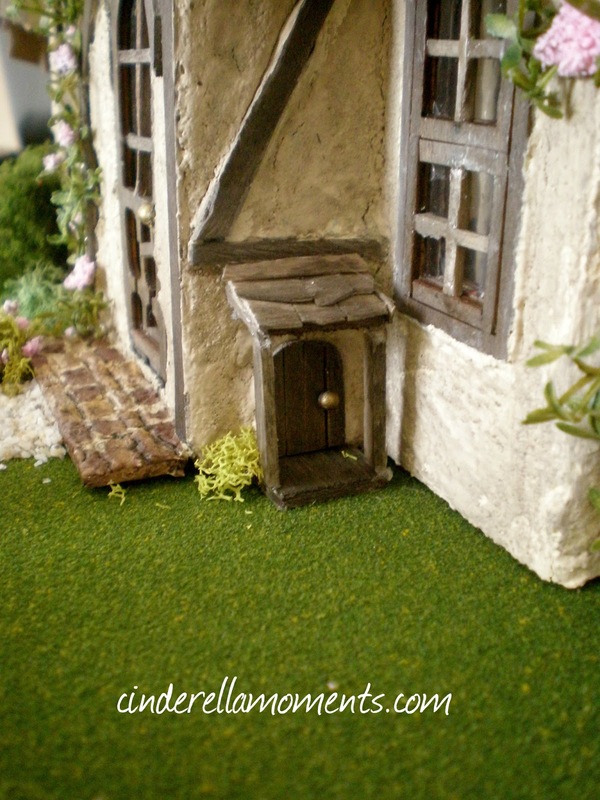 I love the little fairy door! 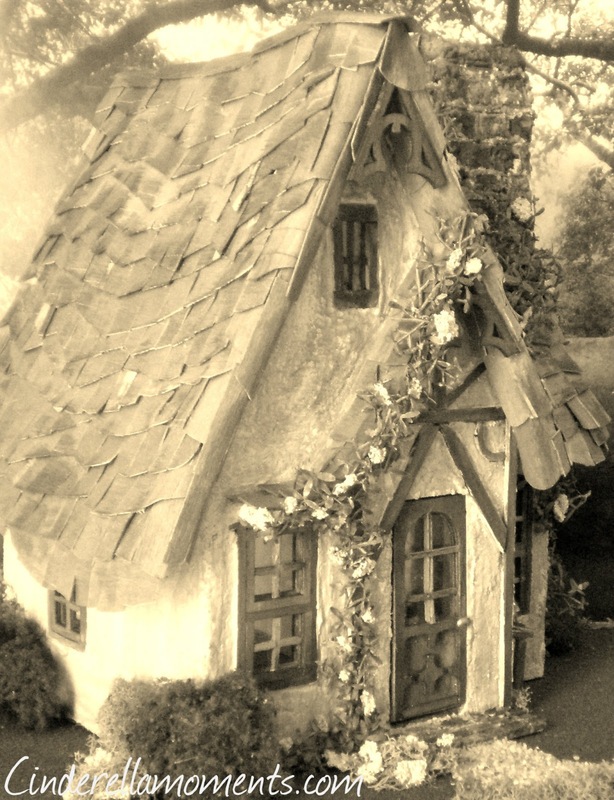 I'm absolutely thrilled by your newest dollhouse! 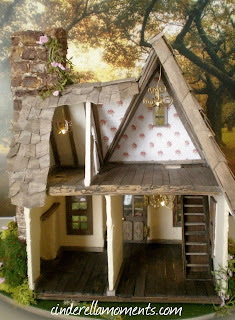 The roof is fantastic and the tiny fairy door is sooo cute! Oh, it's another lovely cottage and I adore the landscaping on this one. It looks fairy-esque! Wooooow Caroline, I LOVE IT !!!!!! This little cottage is the sweetest I ever saw, it is simply perfect ! Caroline, what a cute house! I love the first sepia photograph, complex roof, cream walls, steal boards, nice gate!!! 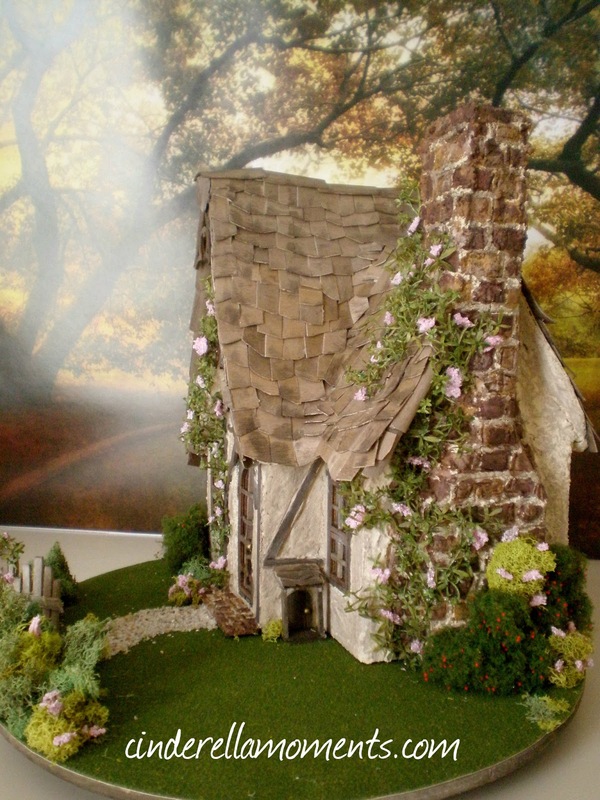 Another enchanting house, it's so perfect. I real feel like seeing an English cottage in a small village. I'm looking forward to see pictures with furniture in it. Me encanta el envejecido que has hecho se ve fantastico. El jardin es una verdadera maravilla. Wow Caroline another amazing wonderful creation. 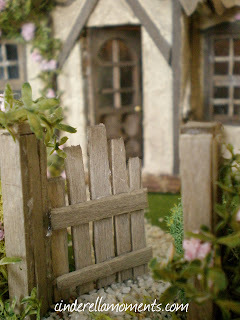 I love the little gate and the gorgeous roof. 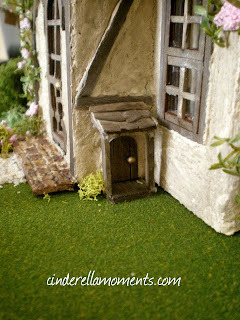 The little fairy door is so cute. Beautiful marvellous work as always. I love this one! 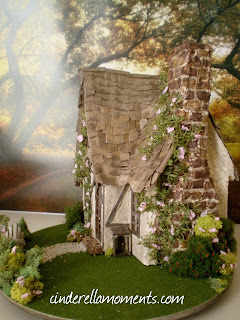 I want to live there! It is so precious and you have outdone yourself this time. Good job! 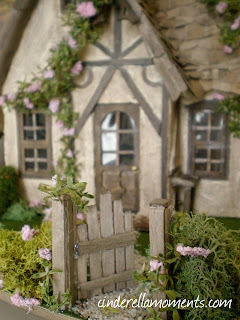 My incredible little cottage arrived today and yes everyone, you really do want to live in it! The craftsmanship is amazing. All the little quirky bits that give it so much character, all beyond desciption. Caroline and I wrote back and forth as I had a few requests but what I really wanted was a Caroline original. When he saw the photos, my husband commented that the floors looked a little rough and why were the shingles crooked? Men! I'm slowly buying the best things I can afford. No "Made in China" stuff for Miss Read! I have purchased some Tootsie Toy things, the real things from the 1930s, for this cottage. A monitor top refrigerator as well as a toilet and sink. I am placing this as immediate post-War and no one in England would have modernized their homes since the 30s. I have purchased several things from England: Aga stove, kitchen table, and bed, all handcrafted. On my limited retirement income, I will have to move slowly but no compromises accepted. I will post pictures as I have them. I do hope all of you Caroline fans will enjoy my efforts. Now, if only I could win the Lottery! Linda- I would soooo love to see the pictures- I hope you will come back and let us know where to find them :) Your little home sounds wonderful already! Finding good quality things for half scale takes some looking. 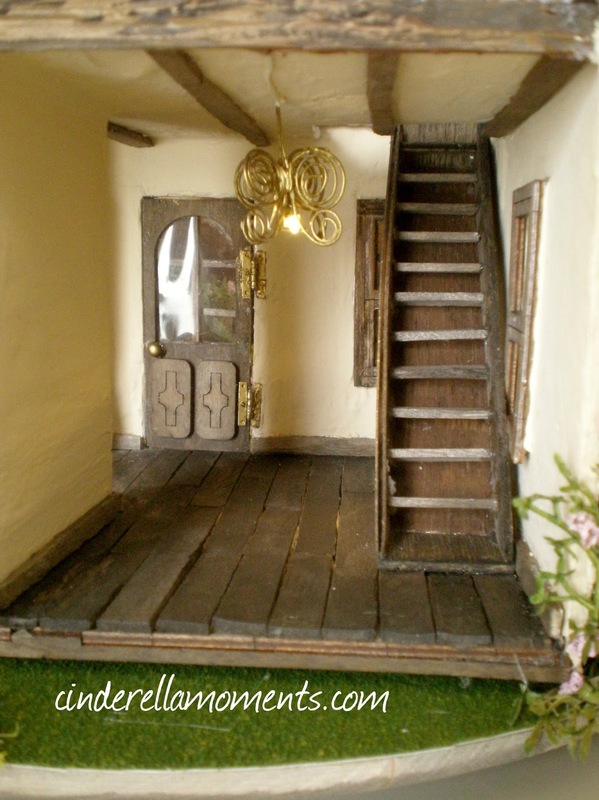 I bought the kitchen table and Aga from Malcom's Miniatures in England. 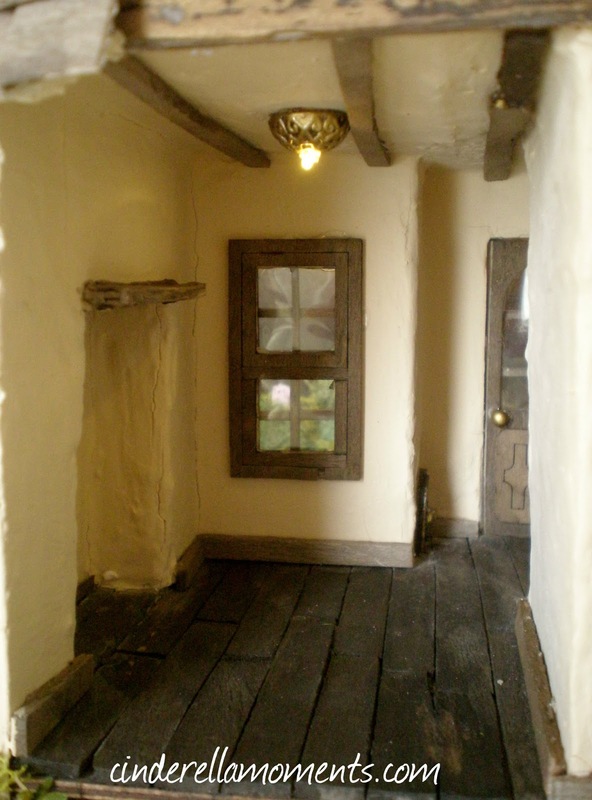 My favorite place for British made things that are of nice quality is Homes in Miniature in the UK. 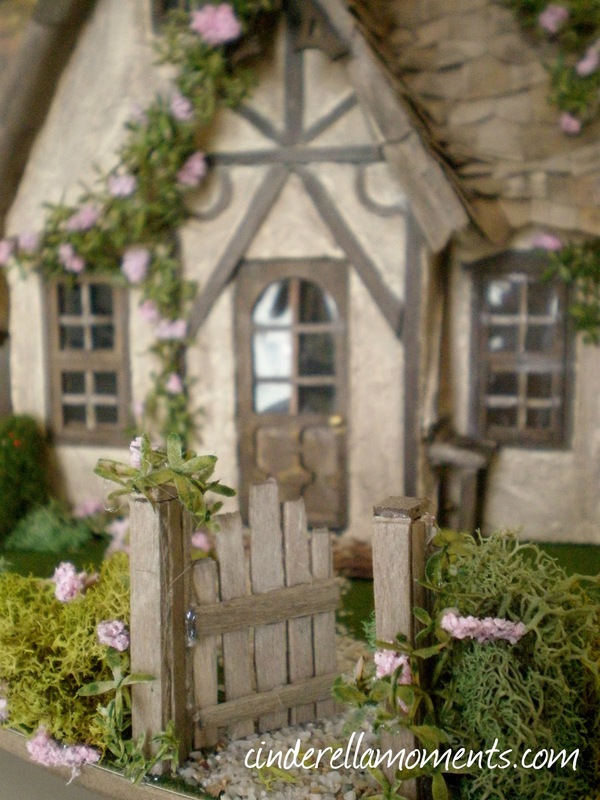 My wicker garden furniture will be coming from Uncle Ciggie's Miniatures in the US. I'm thinking a nice set will be a great Valentine's present from my husband. And you just can't beat Tootsie Toys for authentic items that are half scale. As for good dolls, none have impressed me enough yet. There will be a Tom Bishop show in Atlanta in March, a week before my birthday. I'm already telling folks to give me cash in advance and I'll return the purchased items for them to give to me. How's that for being helpful! WoW! Adorable as usual! You really are so talented! Hello Caroline, love your work and your blog is very inspiring. Me encanta la estructura de este cottage,el tejado tan inclinado,esa ondulación,el jardín es una maravilla,todo el conjunto es precioso!!!! I have dipped my toes into Shabby Chic and would love your feedback? I'd love it if you would check out my latest post and give me any tips you might have on giving a dresser/wardrobe that shabby chic look. I have some Shabby Chic prints saved on my computer. I love the latest house you designed by the way! 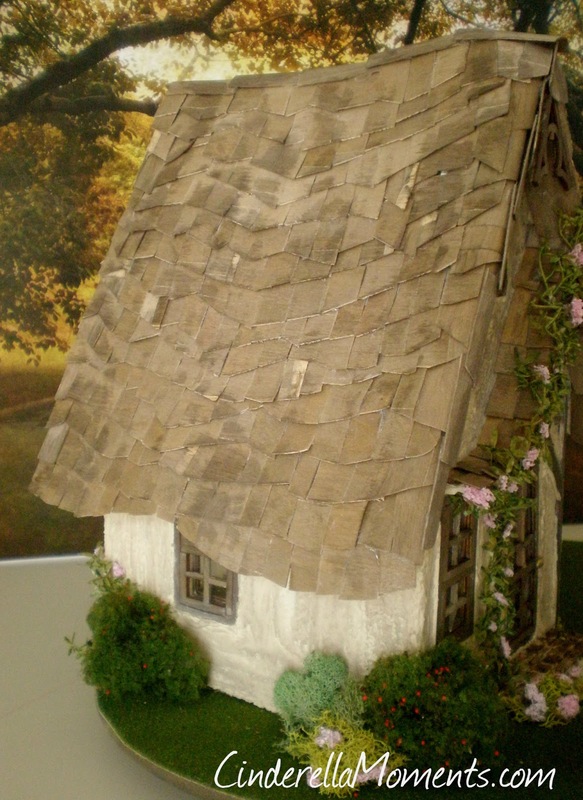 I really like the wavy roof on this house. Its soo cute and the little front yard. Another favorite in my book. This just too adorable! Also thank you for the New Years shout out! I've been MIA since my baby was born. Just got back to viewing blogs. Happy New Years to you and your family as well! 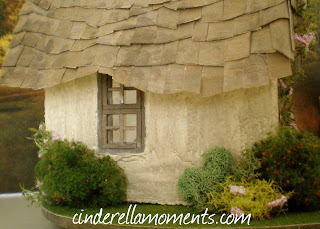 This dollhouse is beautiful and looks so realistic! 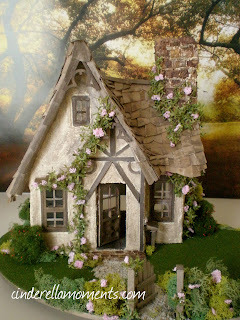 I have just purchased a dollhouse kit and Jennifer of Plushpussycat suggested I look at your blog for decoration ideas and materials. I feel very inspired, you do great work! I'm so happy to have found your blog! For me, it is all dreaming, but I love to dream. :) Are there any pictures for me to fawn over of the (partially) finished house? I'm also a big Miss Read fan. 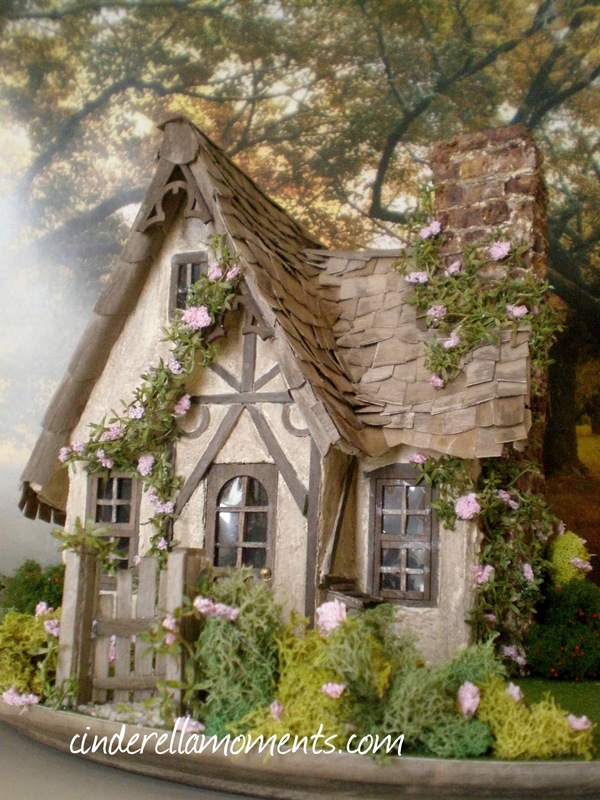 Linda - I have read and have all of the Miss Read books and can't wait to see your decorated cottage! How exciting! Fabulous talent! I want to move in. I have that same rose print as drawers liners in my cottage.